There are times when I feel like I need to bake something immediately. I start hastily flicking through my cookbooks and bookmarked recipes to find something I could make from ingredients available at home. Usually I spend too much time doing it. Usually I find tons of recipes I can’t use for a reason like a missing ingredients. Usually I’m so tired from this. I try to fight it. My motto says the more you bake/cook, the better you get, I hope it also works when it comes to picking a recipe. This recipe is not fancy, I would call it rather rustic, especially if you don’t roll out the dough too nicely. I picked this tart or actually a mix of tart and pie because I like boiling sugar and because making traditional apple pie seemed too exhausting. 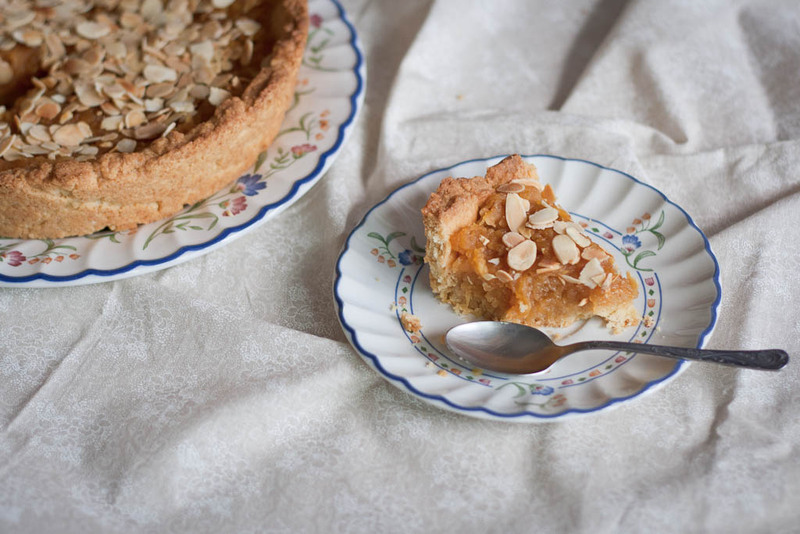 Recipe comes from Addio pomidory blog and I only replaced the almond croquant with toasted almond flakes. With your hands, rub together the flour mixture with the butter cubes until the mixture forms small breadcrumbs. Alternatively, you can blitz it in a food processor for 10-12 second. Add the sugar, egg yolk and alcohol and knead it quickly. Wrap the dough into cling film and put into the fridge for 30 minutes. Grease a tart pan with a butter. Dust it with flour. Set aside. Roll out the dough on a lightly floured work surface until it covers the tart pan. Transfer it gently into the form. Press the dough evenly into the bottom of the form. Prick the dough with a fork. Refrigerate for at least 30 minutes. Bake around 25 minutes or until golden. Add the apples into a small saucepan and put them on a small heat for 10 minutes. Place the sugar and water into a non-stick pan over a medium-low heat. Leave to melt (avoid stirring the sugar until it melts totally). The sugar will start caramelizing and turn golden brown. Cook it for 1-2 minutes. Add the apples and grated tonka or vanilla extract and stir until combined. Transfer apples into the tart base. Sprinkle with toasted almond flakes. Posted in Autumn, Cakes and tagged apples, salted caramel, tarts. Bookmark the permalink. 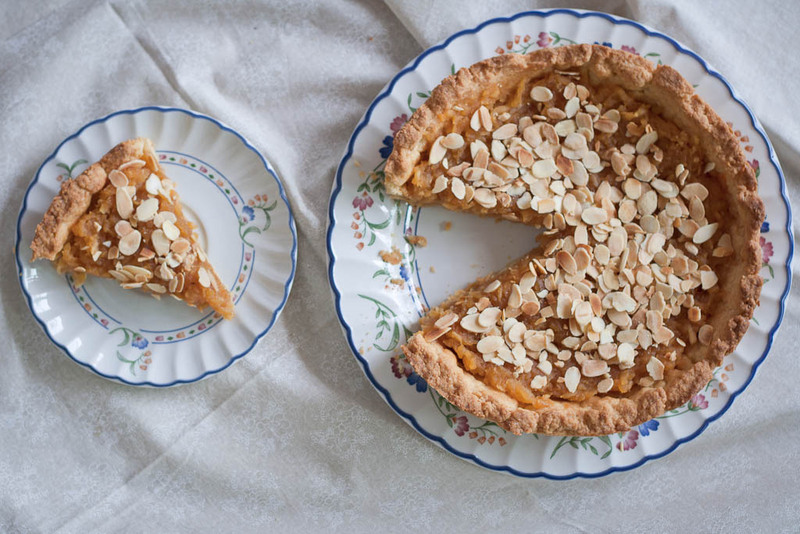 Very good looking tart, a nice variation to the traditional Irish version. Where did the idea to put alcohol in the pastry come from by the way? Sounds good to me wherever it came from!